Becoming a Domestic Gas Heating Installer with Logic4training. Since we opened Logic4training way back in 2002, we have trained over 2000 candidates with transferable skills, helping them to achieve their goal of becoming a Gas Safe Registered engineer. To work with gas you must first become a member of the Gas Safe Register and to do this you must achieve your ACS (The Nationally Accredited Certification Scheme) qualification. This qualification needs to be renewed every 5 years. Most of our candidates are working gas installers renewing their qualifications. Even on our current new entrant courses candidates have some experience or transferable skills from a related industry. Usually this means that they have some plumbing experience or have been shadowing an engineer on the job. For the first time we are able to impart our unrivalled expertise and experience on to genuine new comers who want to become gas safe registered engineers but do not have the level of practical skill or knowledge we currently require to take the APL (our current “experienced or related trade” route). That means if you are after a change in career and are serious about life as a domestic gas heating installer, this is the course for you! Logic4training’s Domestic Gas Heating Installer – New Entrant package (DGHI for short) provides a new entry point that is not currently available to beginners with little or no prior experience. The course is a mixture of practical teaching in our workshops, classroom theory work and online content for revision and support purposes. The new modules for newcomers will run over a period of 20 days during the week. These new modules are only available at our Northolt centre initially. Once you have completed the first 4 week section of the course you can complete the rest of the modules at one of our other centres in Luton or Basildon if you prefer. Experienced Trades Package: If you have a related qualification, such as a City & Guilds 6089 level 2 or level 3, you may be able to undertake the ACS assessments without the need to build a portfolio of on-site work experience. Approved Prior Learning (APL) course for Domestic Gas: If you have related skills and experience usually gained within the industry e.g. Plumber, Kitchen fitter, Electrician, Builder etc, then you may be eligible for our Approved Prior Learning (APL) course for Domestic Gas, which culminates in the portfolio and subsequent ACS assessment. Domestic Gas Heating Installer (DGHI) – New Entrants package: If you don’t have any relevant experience, we offer a New Entrants Managed Learning Programme, which provides all the background skills you need to undertake ACS assessment. What will I learn to do as a newcomer? The New Entrants package covers everything you need to become a competent gas installer. 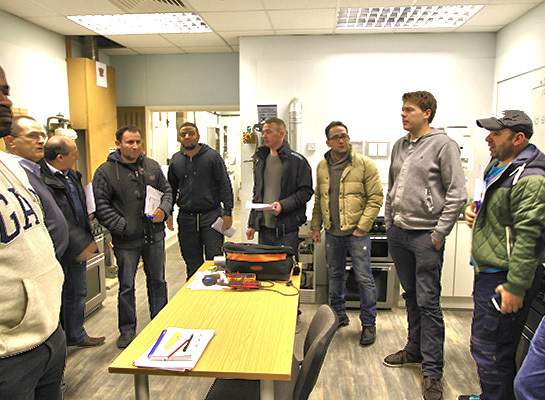 Starting with the basic principles of gas heating and plumbing, the course leads on to technical heating design, gas safety and practical skills. As this is a Managed Learning Programme (MLP), all topics are broken down into easy-to-digest sections, with industry recognised qualifications and certificates of competence awarded on completion of each module, including an MLP training certificate from Logic Certification, necessary to access ACS gas training and assessment. We will also help you with the ACS assessment, including portfolio assistance carried out in real properties supported by a Gas Safe Registered Engineer. The New Entrant package provides you with the basic training followed by the Approved Prior Learning course which is designed to prepare you for your first taste of supervised, “on-site” work. After that the final step is to take your first ever CCN1 training and assessment, which is the final part of becoming a Gas Safe Registered engineer. Pass the CCN1 assessment and you will be awarded with an ACS qualification. Once you’ve achieved this you can work legally and safely as an employee of a bigger firm or start up your own business and be your own boss. Taking The Domestic Gas Heating Installer – New Entrant package gives you all the skills you need to start a new career. Certificates will be issued individually for each of these qualifications which are needed by anyone looking to work in the industry. These are all industry recognised certificates and are all included in this package (there is no need to do them separately).